WinSesame running on your computer in less than 5 minutes! Organizations, agencies, large companies, contact us for the establishment of a pro forma invoice. Delivery upon validation by your accounting department. 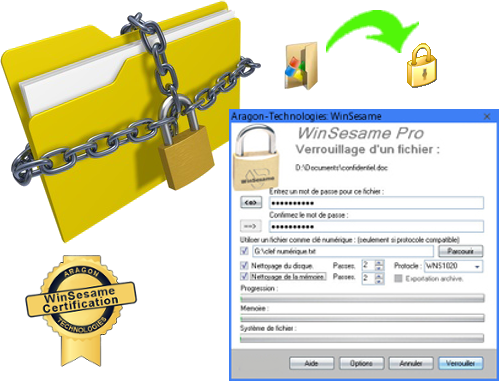 We recommend the use of WinSesame Professional. You have a single user license: Install the software on the additional computer from the link provided for the purchase of your basic license and try to activate. A message will warn you that your token activation is empty and you can not activate this computer. Within 15 minutes you should receive an automatic message giving you a link to purchase a license extension at the special rate. Click on the link and proceed to the payment. You have multi station license : Contact us for an extension of your license. The computers must all belong to the same organization, the same person or the same family. Sharing multi station license is prohibited. If you are a reseller or integrator, contact us for opening a business account.